What could you achieve if you made 2019 your bravest year yet? 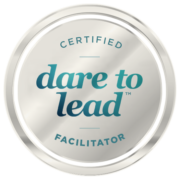 My Bravest Year is experiential leadership development that focuses on helping participants be braver, overcome perfectionism and take smart risks. Despite Google’s Aristotle Study identifying psychological safety as the single most important element in high performing teams, there is far too little of it in the tech industry. For many, and particularly those from underrepresented groups, the perceived message remains the same – stay small, stay quiet, stay safe. My Bravest Year in Tech 2019 is for existing and emerging female leaders and combines world-class coaching with Dare To Lead, the ground-breaking leadership program from Dr Brené Brown and Apple’s Business Book of the Year. Programme members will become an inspiration to the entire industry as they blog and share their journey via social media in real time. They will experiment with letting go of what others may think, set strong, healthy boundaries, step into uncertainty without the fear of failure or hearing “no” and celebrate their imperfections. This program will both develop brave leaders and provide female talent throughout the industry and beyond with meaningful, relatable role models and the reassurance that they are not alone in the fears and doubts that hold them back. We’re a courage building consultancy. We work with organisations who want to become braver by supporting their people and teams to take more smart risks. Meaning – measuring ourselves against how authentically we show up, and not by comparing ourselves with others. Discomfort – our comfort zone is where we operate when we are led by what others may think and the fear of failure. We believe in working from a place that leans into the discomfort that comes with uncertainty and stepping forward without guarantees. Forgiveness –Blame is simply the discharging of discomfort and pain, and we choose forgiveness and learning every time. We practice Self-compassion, speaking to ourselves as we would to a friend in those moments when we can often be our own worst critic. A commitment to share (with appropriate boundaries) via social media your fears, challenges, feelings, goals and lessons learned after each coaching session and Dare To Lead module. A sponsor – a senior member of your organisation willing to speak out and champion your journey at every stage, both within the company and publicly. A commitment to show up and contribute to every coaching session and Dare To Lead module. Last year’s programme for 18 female tech leaders in UK included participants from Barclays, PayPal and the British Broadcasting Corporation (BBC) as well as CEOs and founders of start-ups. Those in the group who identified promotion/increased compensation as a goal, realised an average increase of 22% in pay as a result of this programme. A selection of testimonials from the programme are below. Limited availability – closing date 30th April 2019. For further info please email Bethan or Gareth@thebravestpath.com.